• License Information: This script requires a license; by purchasing a license you're granted usage on 1 (one) UBB.threads installation. Any additional installations require an additional license. Updates are available for 1 year after initial purchase; after this timeframe, to aid in development costs, you must renew your access to updates (see the purchase link below for further information). • Documentation: Screen captures and a full changelog can be obtained on the UBB.Wiki entry UBB.Sitemaps. • Support: Support is available on the UBB.Dev thread [7.x] UBB.Sitemaps. UBB.Sitemaps is a script that we created due to some reported search engine "discovery" issues with the way that URLs where initially written in the UBB.threads product that some users where reporting. Not to mention that a lot of users had moved from previous or competing products and wanted to see their URLs immediately discovered in the Google, Bing, Yahoo, or other search engine(s). 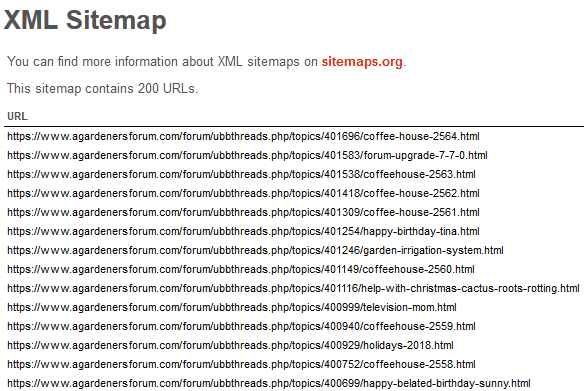 This script aids in the "discovery" portion of search engine crawling; instead of waiting and hoping that your URL's get crawled, an XML Sitemap alerts Google (or any crawlers which allow sitemaps) as to what URLs exist on your forums, so they know what to crawl based on what you tell them. • $45 - Additional Year of Updates. This script is not freeware, it requires a license; by purchasing a license you're granted usage on 1 (one) UBB.threads installation. Any additional installations require an additional license. Updates are available for 1 year after initial purchase; after this timeframe, to aid in development costs, you must renew your access to updates (see the purchase link above for further information). You cannot freely provide this script to others without written permission from the author.